While the original landscape looks nice at first glance, many of the walls and stairways had settled over the years and become unsafe. The homeowners were looking to get more usable areas to enjoy with their family. The old landscape had to be excavated to get ready for construction of the new. 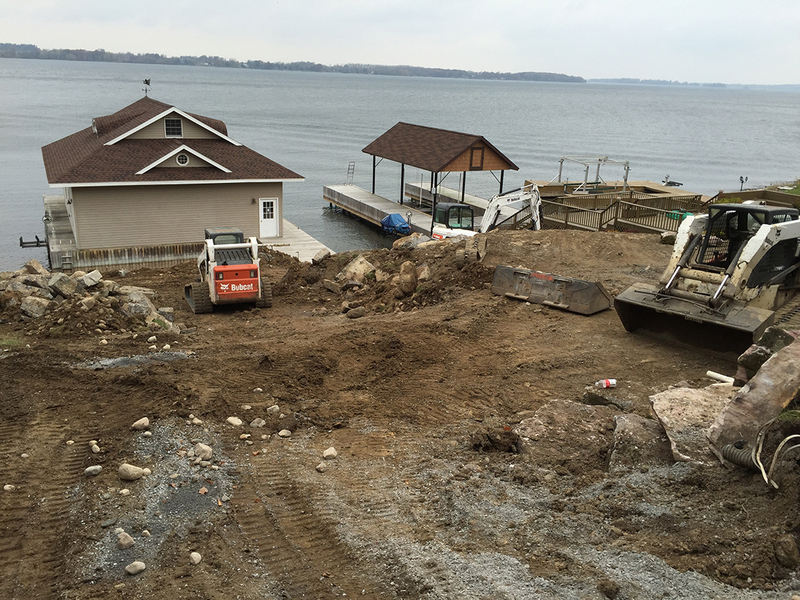 After much excavation to make way for a lower patio by the water, the first boulders and patio stones go in. This would later become a favorite hang out spot to watch the kids swim and enjoy the river. 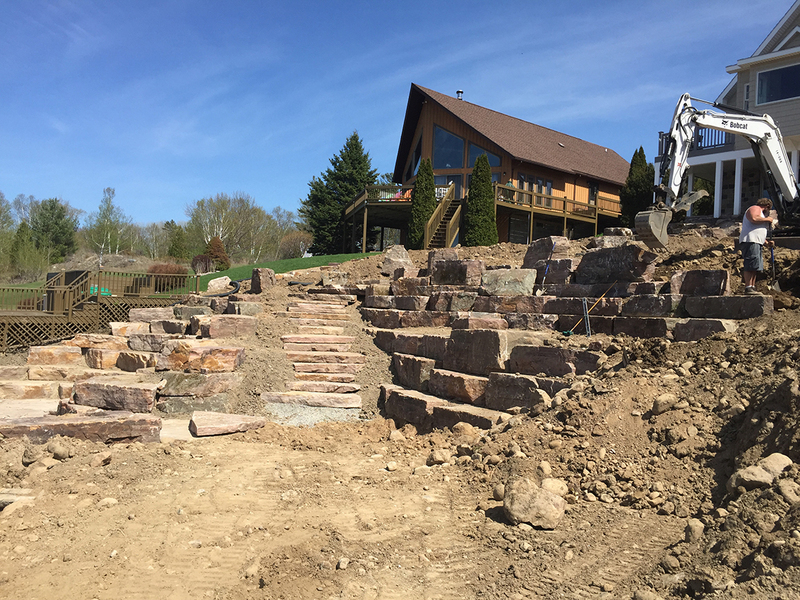 With the first two areas completed with flagstone, it was time to start building the stair system to the upper landscape. As you can see, it is a bit of an art form chiseling and piecing in these large pieces of sandstone. You can also see how the boulders are stepped back to create an amphitheater feel to the lower patio so you are able to hang out and sit in a variety of locations. 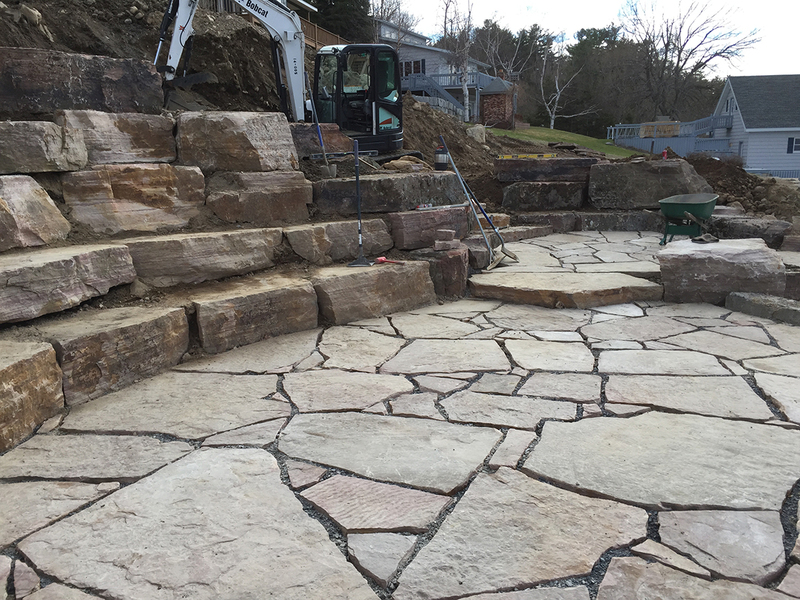 Here boulders, terraces and large "user friendly" sandstone steps are being installed—working our way up to the eventual large upper patio. In this picture, we have connected the lower and upper landscape with a large set of sandstone steps. 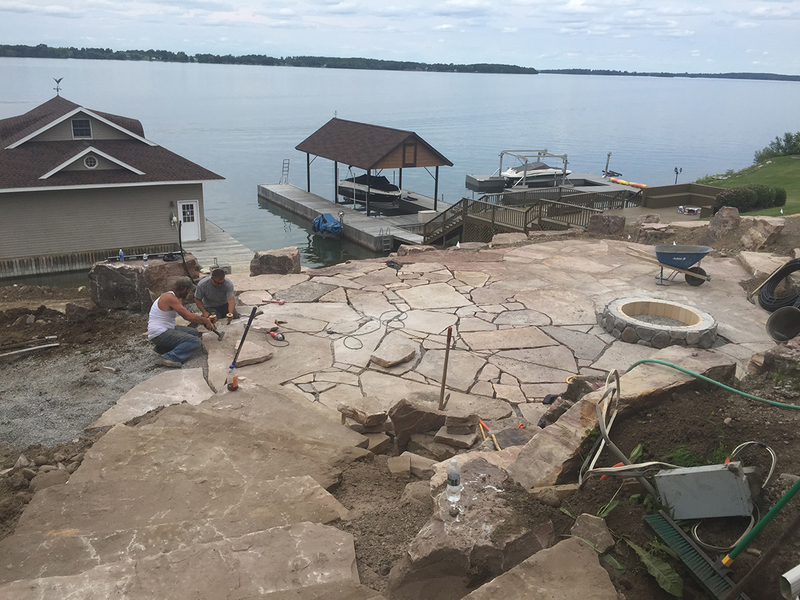 The upper patio stone is now going down along with the form for a wood burning fire pit. We extend the upper patio to accomodate a future hot tub. 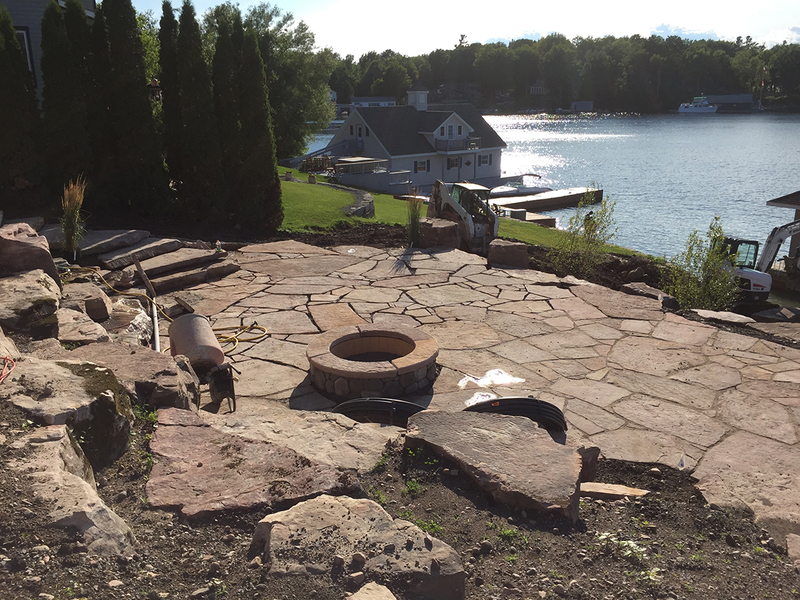 The fire pit is veneered with river rock, lined with fire brick and awaiting its sandstone cap. Another set of sandstone stairs leading to the house have also been built. 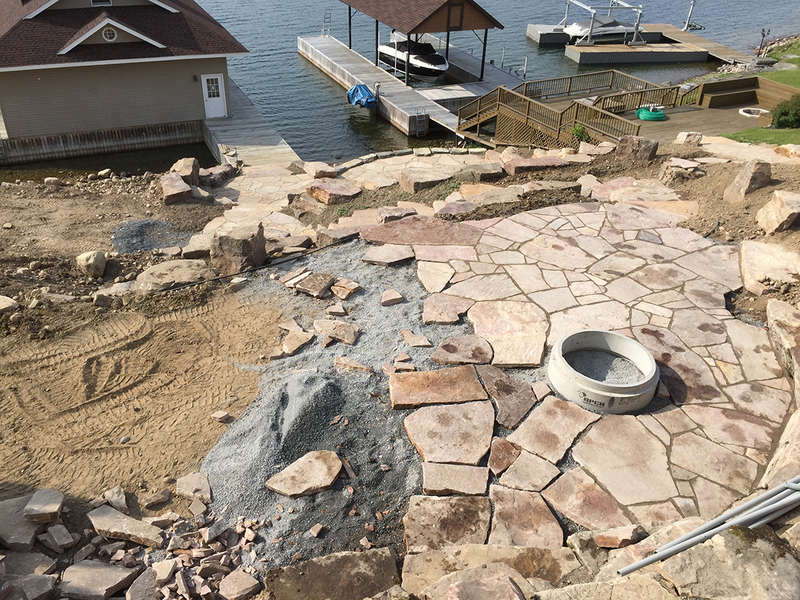 A second view of the upper patio shows the sandstone cap on the fire ring and the beginning of waterfall construction. Upper patio finished to the stream's edge, it's time to construct a waterfall. 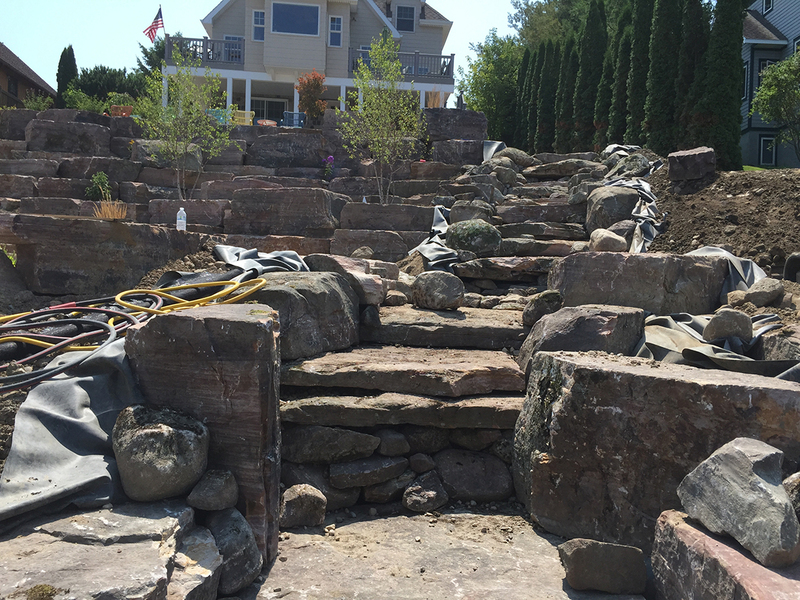 We carefully arrange large, mossy boulders and ledge stones on a sturdy rubber liner. With most of the boulders and stones in position, we use 4" heavy duty PVC flex pipe and a 5hp pump to draw water for the falls from the river. The falls are now ready for water. Shrub and perennial planting has begun. We've run an underground sprinkler system throughout the landscape for easy maintenance. The falls are up and running and sounding great. 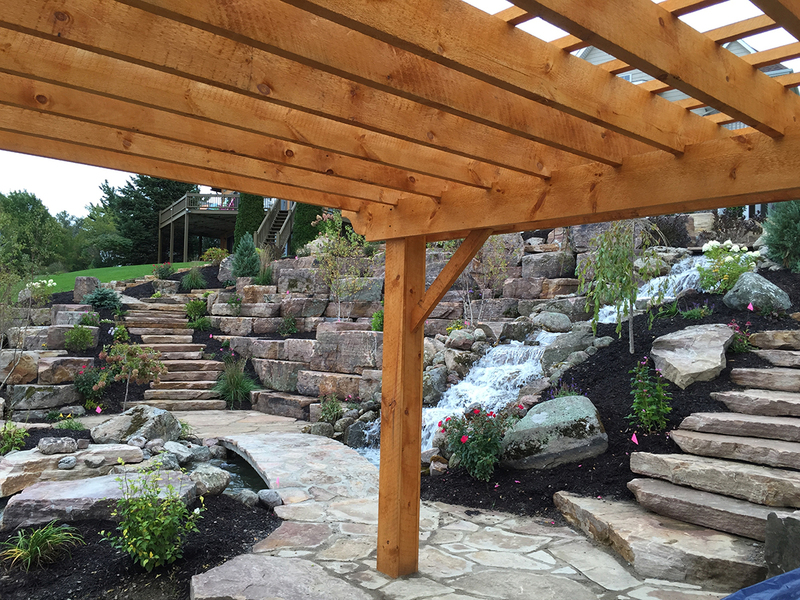 An arched stone bridge spans the falls, leading to a flagstone patio covered by a rough sawn pergola. 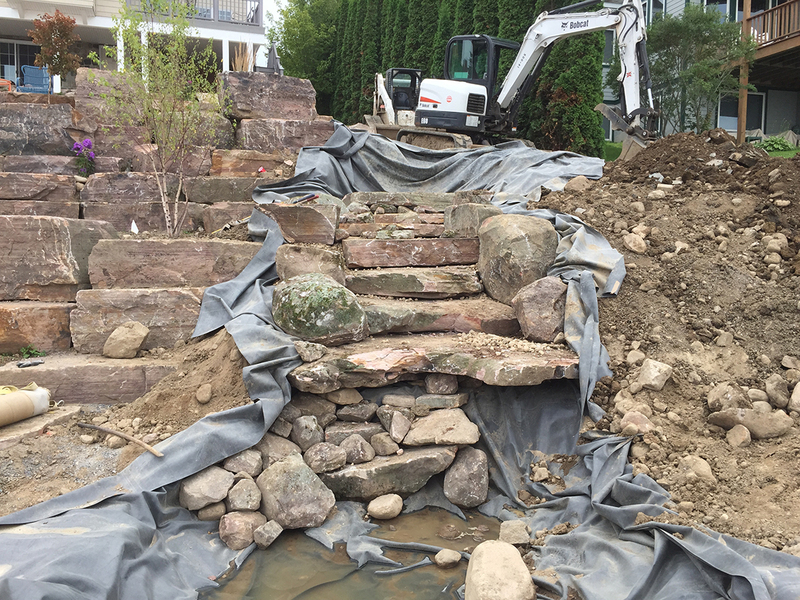 An additional set of stairs leads to the upper patio, creating a variety of paths through the new landscape. 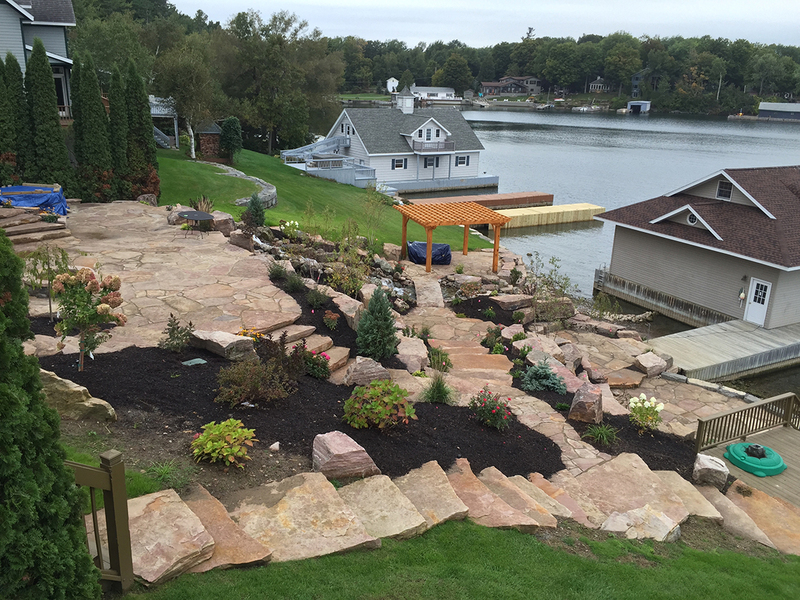 Another view showing how beautifully the new landscape comes together. 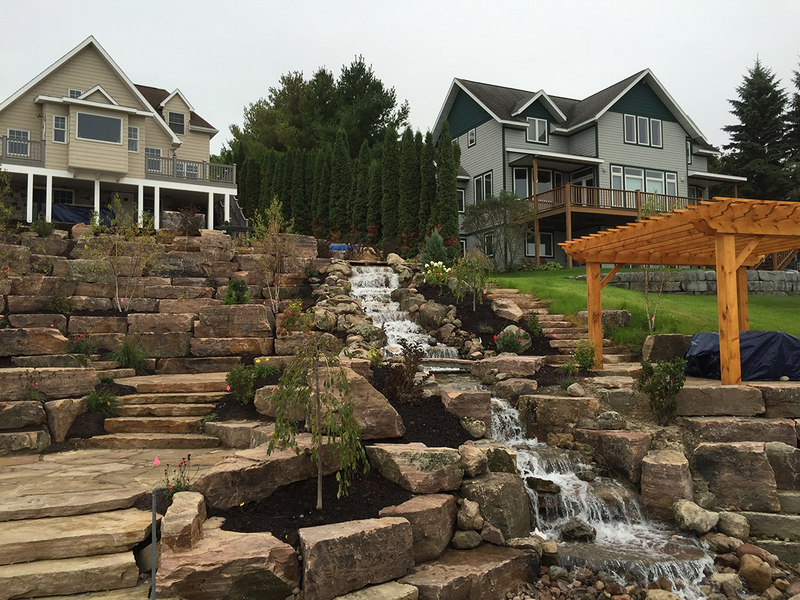 Patios complete...plantings placed...pergola, fire pit and outdoor kitchen built...waterfall flowing. It's time to enjoy this unique landscape. It all began down here. Here is the completed upper patio. 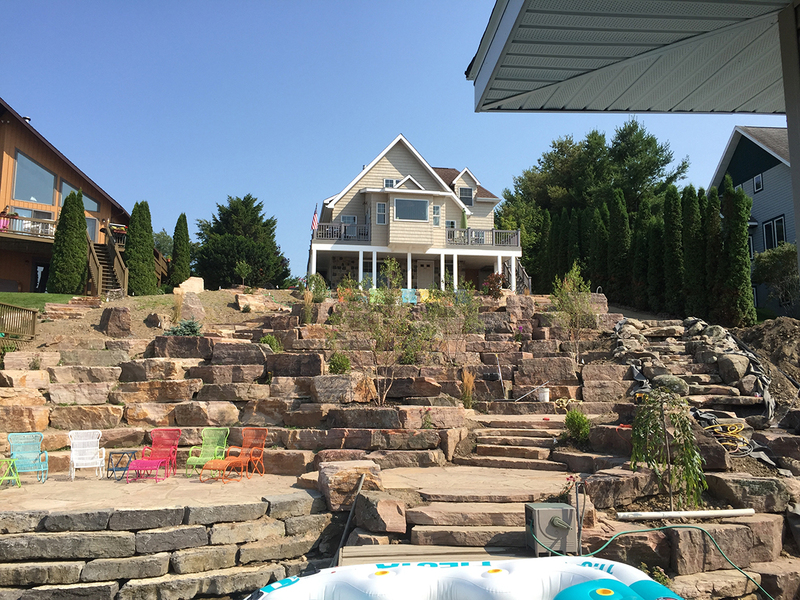 You can see both sets of sandstone stairs leading down from the house to a favorite evening hang-out spot: the fire pit. 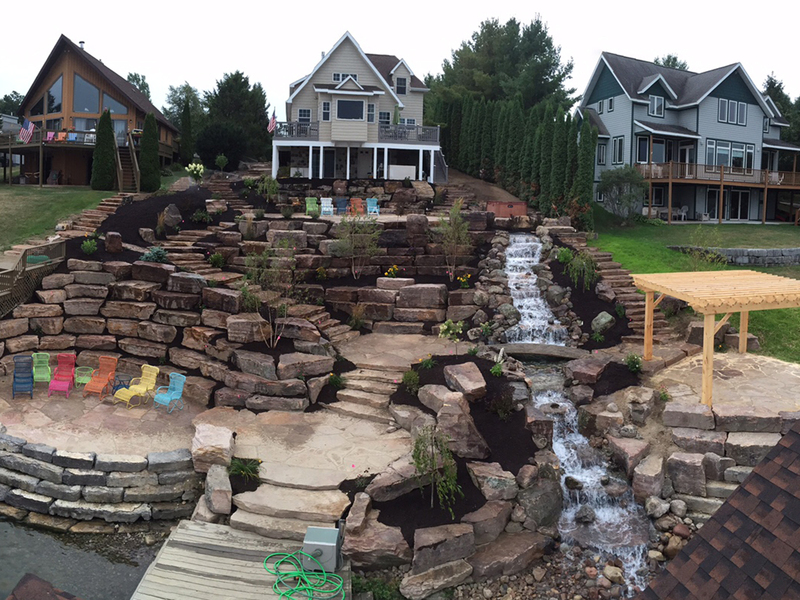 Here is another angle, looking East up the St. Lawrence River, at the completed landscape. 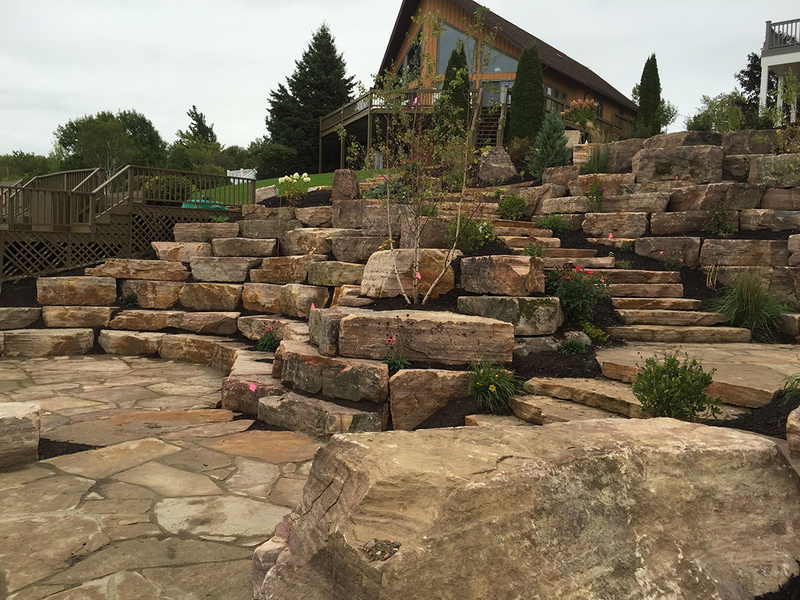 This view shows the different levels of patios with the stair systems that wind through the landscape. 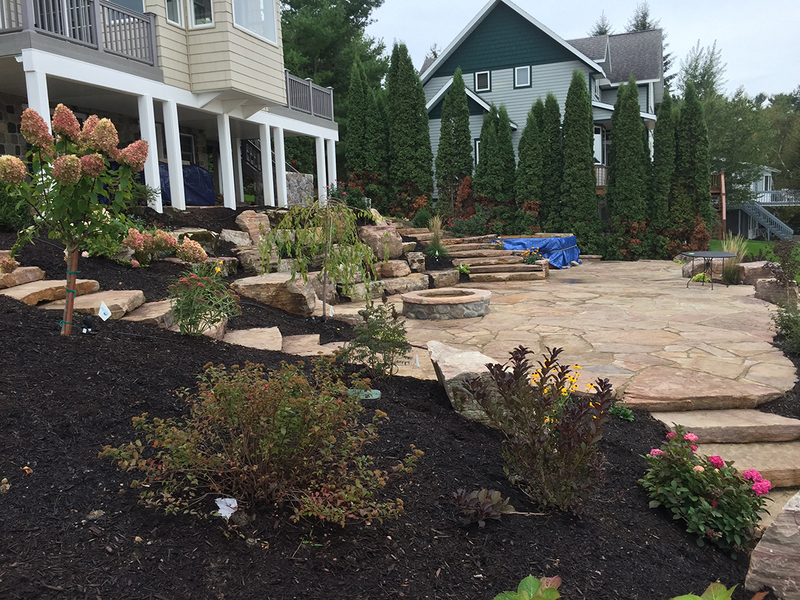 The project is built entirely of natural stone and will only look better with time as the hundreds of perennials and shrubs mature and fill out. With the new waterfront landscape complete, there are a variety of locations to hang out and enjoy from a cozy fire on the upper patio, to lounging under the pergola and reading a book, to watching the kids swim from the lower landscape patio by the water. 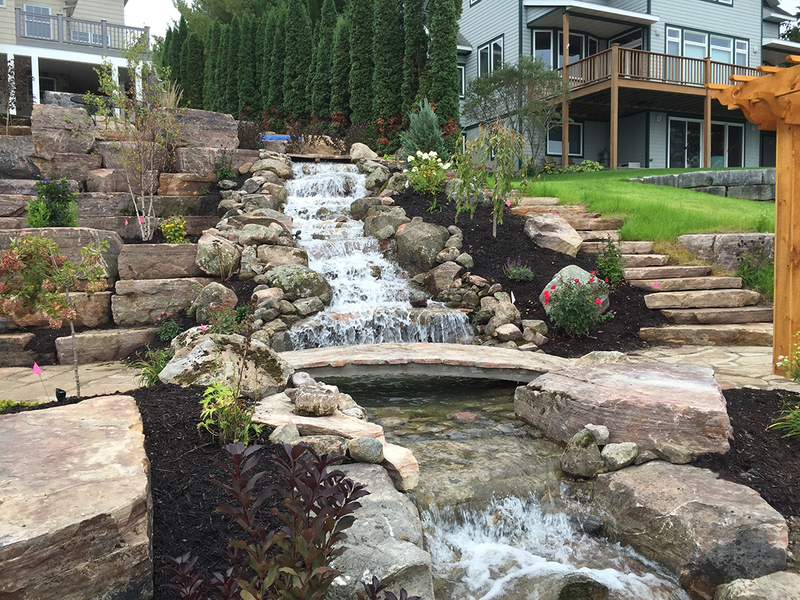 Sawmill Shores Upper Falls by Creative Landscapes Design & Build Co., LLC on Vimeo. 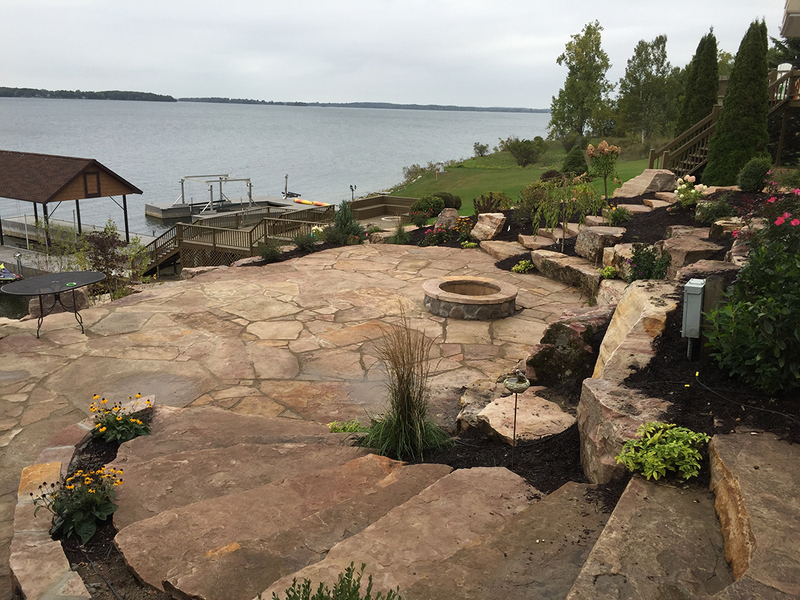 The homeowners needed larger patios to accomodate a growing family of grandchildren and allow a variety of relaxing outdoor space. 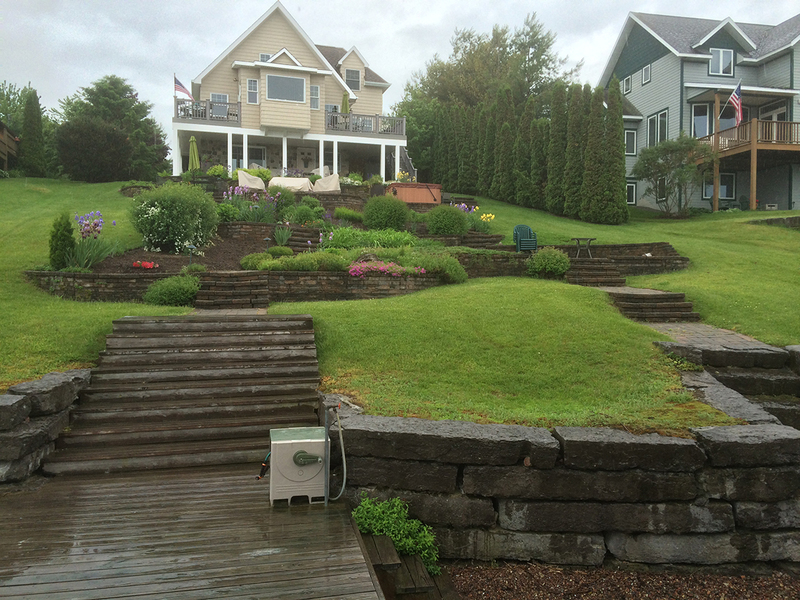 We removed the now unsafe retaining walls and cut the hillside back to allow multiple terraces. Using sandstone cut to size from our own quarry, we built up from the river creating multiple stairs, seating areas and pathways. 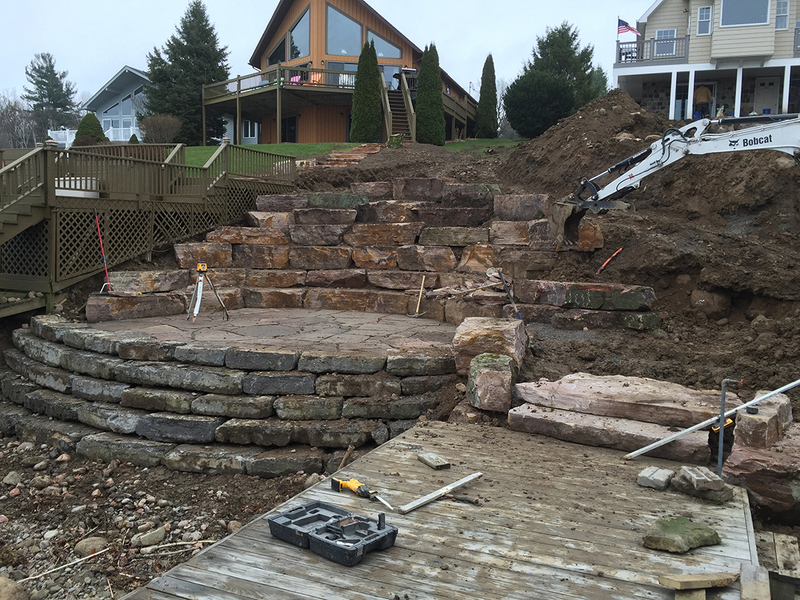 Natural stone stairs, retaining and sitting walls. An underground sprinkler system throughout to maintain the plantings.